America’s ports are its economic lifeline to the rest of the world, and are in danger of becoming a hindrance to our nation’s success. In the second segment of a five part series on infrastructure in the U.S., PBS NewsHour Senior Correspondent Ray Suarez reports with Blueprint America from one of the nation’s busiest ports: New Orleans. Although billions of dollars have been spent on New Orleans to help the city recover from the devastation of Hurricane Katrina, one key to the city’s economic stability in the future may be its ability to revitalize its port system, which was built over a hundred years ago. In just over ten year’s time though, the amount of cargo it must handle is expected to double. Without heavy investment and careful planning, the already stressed New Orleans’ infrastructure will not be able to handle the imports and exports that local officials are hoping will help the local economy return to health. 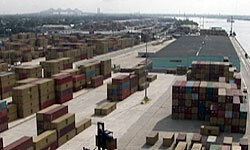 New Orleans’ aging port is emblematic of others around the country. In the wake of Hurricane Katrina, and the recent string of hurricanes, finding the money for improvement is difficult, especially as the city’s resources are already stretched.